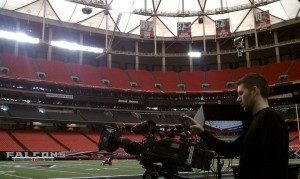 It’s that time of year again….Superbowl…..which means NFL playoffs are keeping our Go To Team camera crews busy. Here in Atlanta we’ve been working on coverage of the Falcons, and aside from a disappointing loss to Green Bay on Saturday night it’s been a fun month of shoots for us. This week we met up with Terry Bradshaw and Matt Ryan to shoot a segment for Fox Sports Pre-game Show. You can check out the piece below or online here at FoxSports.com. Game night put us at the GA Dome with CBS Sports to shoot live pre-game and post-game coverage of the Falcons/Packers matchup. Our camera choice ended up being the Sony F900 with an accompanying NanoFlash. Cable drops at the game limited our ability to feed an HD signal from the field to our satellite truck, so the F900’s Miranda Box allowed us to down-convert our signal to an oversampled 16:9 SD image for broadcast, while the Nanoflash allowed us to simultaneously record in full-raster HD for archival purposes. For our pre-tape segments we were able to feed our HD signals via our uplink, but still recorded in multiple formats – HD to tape and SD to Nanoflash – allowing for maximum flexibility in the field. We were hoping for the Falcons to stretch out their playoff run a little more, but on the bright side, Go To Team will still be going to the Superbowl. More to come…. Working on the sidelines at the Falcons vs. Packers game for CBS Sports.